What Does the Pressure Switch Do? For hot tubs that use a pressure switch, topside error messages such as FLO, FLOW or FL may appear. This leads to the removing of the filter, restarting of the spa and other home made remedies. More often than not, further investigation is required and the switch may need to be adjusted or replaced. a dry condition that could cause a fire or explosion. The pressure switch does not allow the spa to heat when a dangerous condition is present. 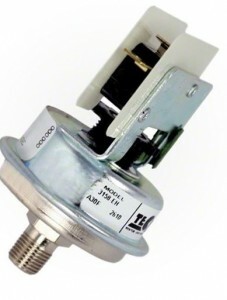 Get a replacement hot tub heater pressure switch at HotTubOutpost.com. the electric spa heater is completed and the spa is allowed to heat. If the spa pump or circulation pump becomes defective, the pressure switch should sense inadequate water pressure and not allow the spa to heat either. So even in the case where there is no leak, there is enough water in the heater tube, a pump failure without a safety device could allow water in the heater manifold to sizzle and begin boiling creating a hazerdous condition. Another cause for the pressure switch to make sure the spa does not heat is when the filter is dirty and the resulting clog does not allow enough water to flow properly across the heater element in the heater tube. The pressure switch itself can go bad when exposed to improperly cared for water. Abnormal ph levels can quickly degrade the pressure switch. a blocked footwell suction, an air lock in the pump or a defective circulation pump. If the circulation pump is on but the water does not appear to be moving, then there may be an actual flow related issue. The pressure switch is often located either on a PVC plumbing part next to the spa pack or directly mounted onto the stainless steel heater manifold or tube. The heater manifold can be found either underneath, inside or attached to the power control box. 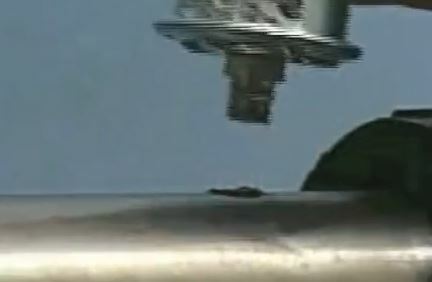 To further troubleshoot a pressure switch, a technician may turn off the power to the spa and remove both wires connected to the pressure switch. They may then place the 2 wires together with alligator clips or wrap them in electrical tape. water is currently set at and the unit is in Standard Mode so that the heat will come on. 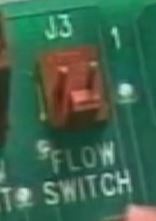 If the heater does come on and the the FLO error does not appear on the panel, then the switch may need to be replaced, but only after being sure there is no real obstruction in the line. heater comes on at a lower pressure. If the switch is calibrated to be too sensitive, then the heater may not turn off as quickly as it should and OH or overheat errors may occur. be used until the condition can be repaired. Most pressure switches can be calibrated. Many have a little black wheel with indentations that can be rotated to fine tune the sensitivity of the pressure switch. They usually are shipped factory calibrated. The pressure switch connects to the spa pack via 2 wires. 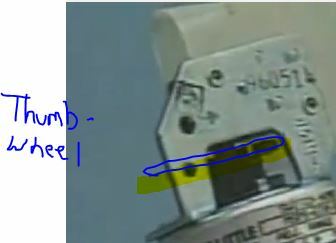 Any problems with this connection can also result in failure of the pressure switch, for example if rodents have chewed through it. The pressure switch is in the OPEN condition when there is no continuity. When calibrating the pressure switch, it is done with power to the spa off. With the wires that go to the spa pack removed, the free mounted pressure switch can be connected to an ohmmeter and in the OPEN state (no continuity). As the adjustment wheel is turned counterclockwise, one point is reached where continuity occurs. To make sure the setting is not too sensitive, another half turn clockwise past the point where continuity occured on the meter should assure it is properly calibrated and will not shut off due to nuisance tripping. Counterclockwise turns to the pressure switch adjustment wheel decrease the pressure required to allow for heating. Turning it too far counterclockwise is not good either in the case of a real fault. The pressure switch could even go to the ON condition with the pump turned off. This is a dangerous condition because the heater must shut off anytime the pump shuts off to prevent overheating in the heater tube. 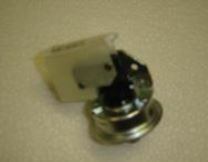 A damaged pressure switch, or one full of debris should be replaced. Note that when the pressure switch is replaced, water will come out of the heater tube as it is usually screwed into a hole right in the tube. To prevent flooding, shutoff valves must be used and water allowed to escape from the heater tube by opening the heater union and allowing water to flow away from the spa, or the spa drained. Any water not properly removed from the heater tube may indescriminantly get all over the equipment bay, wiring and other components. Pressure switches with barbed fittings and a hose that connects it to the heater may be easier to replace on the fly by having the replacement unit ready for exchange. The wires that connect the pressure switch to the spa pack carry a voltage and should not be allowed to be immersed in water. When in doubt, leave the electrical repair of hot tubs to hot tub service technicians. Replacement hot tub pressure switches come with different connection types and thread sizes. They can be metal or plastic threads, they can have threaded connections or barbed connectors. The 2 male spade connectors are for connecting the pressure switch to the spa pack with the pressure switch wires. A closed circuit allows the heater to operate since it gets electricity that flows from the spa pack via the pressure switch or safety device to the heater. Pressure switches can be adjusted by turning the wheel while the pressure switch is below the water line. One device can thus monitor for clogged filters, air in the line, a bad or unresponsive pump, inadequate water pressure and other anolmalies that could cause overheating of the heater tube. If there is good water flow but the heater does not work, there could be several reasons independent of the pressure switch that could cause heater failure. The best replacement pressure switches have a metal threaded connector that can be wrapped with white pipe tape for a good seal. Hot Tub repairs can be dangerous and should be left to those qualified to perform hot tub service safely.